Made this with about 8 T butter instead of full amount, and fewer chiles and pepper and it was still amazing! Brilliant recipe. If you are not convinced by tofu, try this. My daughter and I loved this dish, but my husband didn't dig the amount of pepper in the recipe--might take it down to 3 Tbsp. next time I make it. Even made with half the chiles and pepper, this is a fiery hot dish and I felt that the lovely caramel flavours of the sauce were overwhelmed by the level of heat. Like some others, I replaced all of the butter with just a few tbsp of oil. Extremely good! Recipe calls for a stupefying amount of butter; sadly it was not as good with less. Something about the fat coating the tongue makes the pepper really work, so I am working on other replacements for butter. I like to add eggplant (cooked like the tofu in a little corn starch), and red bell peppers for color. The technique for tossing the tofu in cornstarch (cornflour) before sautéing changed my life- it is the only way I do it now. That said I much prefer other sauces to this pepper which is admittedly not my thing. 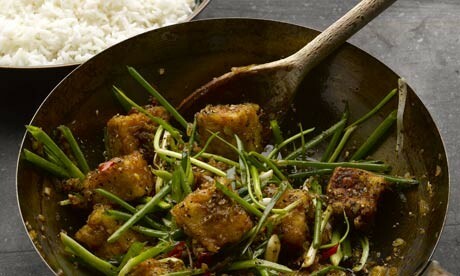 My favourite tofu recipe, and one I cook again and again. I love how spicy it is, and leaving the peppercorns slightly coarse gives the sauce a nice texture. Like other notes, I use nowhere near the amount of butter specified in the recipe, and add a little peanut oil. I also lightly steam vegetables (broccoli, carrot, cauliflower, snow peas, cabbage - whatever I have really) and add that at the end along with the tofu. This was pretty great. I halved the recipe, and used 2 Fresno peppers, de-seeded as the chiles, and the recipe could have used a tad bit more heat. I finely ground my pepper and that worked for us. I also skipped the butter for much less peanut oil for the aromatics, with just about a teaspoon at the end for some flavor. Since I've been obsessed with Malaysian food and therefore cooking a lot of it, I actually had all of the soy sauces on hand and they did contribute a wonderful depth of flavor to the sauce. (Sounds like from others that the dish works without them though.) Finally, maybe the best part of the dish was the wonderful pieces of garlic, which basically caramelize and get really sweet and tasty. I made this with about 5 Tbsp olive oil instead of the called-for 11 Tbsp butter and thought it was fine. If you don't have light or sweet soy, don't sub with regular "dark" -- the saltiness will be unpalatable. This recipe is unbelievably good. It is pretty peppery but you can always reduce the amount. The cornstarch fried tofu has a lot of other applications too.